Whether you’ve just received your Open Water Diver certification or have logged hundreds of logged dives, the PADI Specialty Diver program, which culminates in the prestigious Master Scuba Diver rating, takes your diving to a whole new level. Dive deeper into topics that interest you. 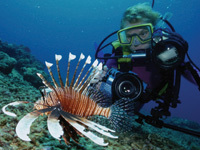 The most popular Specialty courses are Enriched Air (Nitrox) and Underwater Digital Photography. Both are available in PADI Digital formats. Altitude Diver: Interested in local diving – this is a must! Boat Diver: Become a ship-shape diver and learn your way around a boat. Deep Diver: Expand your horizons – go deep! Digital Underwater Photography* : Capture your memories! Dry Suit Diver: Diving isn’t just for summertime anymore- Dive Dry! Enriched Air *(Nitrox): Gain back bottom time by diving Nitrox. Equipment Specialist: Protect your investment – learn to care for your gear. Night Diver: Check out the night life! Peak Performance Buoyancy: Fine tune your buoyancy skills. Underwater Navigator: Use your compass like a pro! Specialty classes are available throughout the year, during Camp and Dive weekends, and on trips. Call for details and to schedule your class.